We can talk about the weather—but what does the weather say about us? We can track the forecasts, eyeballing the weather askance as any animal might keep tabs on a neighboring predator. A hail of umbrellas sailing up and down a city street. Shadows that will not explain themselves. A thunder god striking out with a bolt of anger. Thermometers, barometers, and the weatherman, the resulting divination and their sums posted and printed and explained in every possible media. We can talk about the weather. Whether we stay together, whether we drift apart. A pocket of air becomes a roller coaster becomes a death becomes a career. A modern monster blows in and out, turned out in a grey suit and leather oxfords. Houseplants have gone rogue in lush rainforests, gaining impossible circumference in heavy rains. Given the right weather, we all threaten to grow in impossible directions. 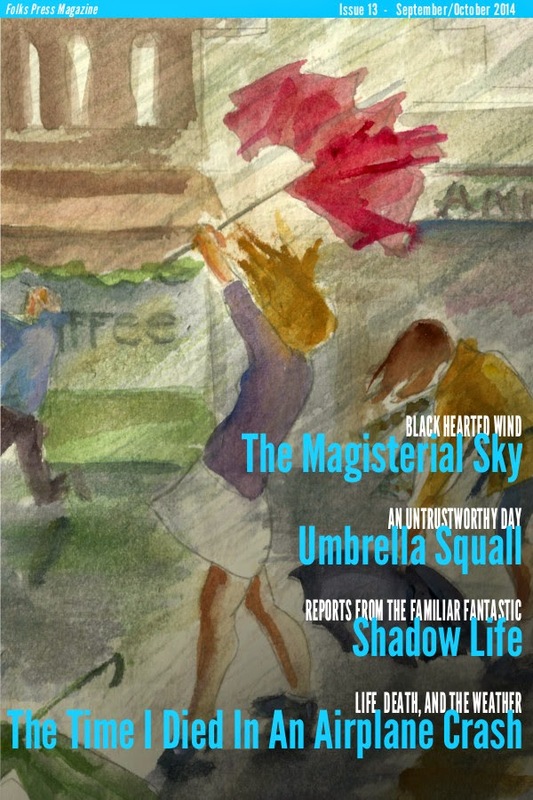 Come see what the forecast is like in Folks Press Issue 13: The Weather Issue! and galactic rocks and golden plants. Rock collectors dreaming. Hotel owners horse talking. Waitress geologists chatting up the murder. Unkempt fellows drifting in and out. And a last shooting star. It's like a tsunami of ugly.